Many of us have become extremely versed in using on-screen keyboards for dishing out long passages of text, it just becomes so natural. Still, other folks will still vouch that the best experience is still a physical one, like what we get from a traditional keyboard. Making itself ready for the challenge of the on-the-go lifestyle, the ZAGG Pocket Keyboard aims to appease those individuals that prefer a tactile response. Truly mobile, the ZAGG Pocket really condenses down for easy stowing while you're traveling. With its folding hinged design, it's able to collapse into a an elongated and slim rectangular footprint, which doesn't occupy a whole lot of room when it's placed in a bag. Better yet, ZAGG’s implementation manages to retain a full QWERTY layout – one that unfurls in between rows, so that it keeps the layout we're used to using with a traditional keyboard. Flipping it open to expose its entire layout, the ZAGG Pocket automatically turns on and connects to our smartphone via Bluetooth – a Samsung Galaxy S6 edge in this case. A small part of it flips out to accommodate a phone, both in landscape and portrait orientations, but we wouldn’t say it’s something that would accept tablets. Paying attention to the chicklet-styled keys, they’re decently spaced from one another to minimize accidental presses when typing at a quicker pace. However, there’s no denying that the layout is cramped, which is something we suppose is the compromise in making such a compact styled keyboard. In our experience, though, the ZAGG Pocket is most effective when using it on a flat surface – it just won’t work well anywhere else. For one, flat surfaces allow the phone stand portion to stay smoothly in place. If we were to use it on our lap, there would be too much movement to keep our phone steady in place. Initially, we required a bit of time getting adjusted to the layout, but after a while, it became second nature to us. Of course, we appreciate that the layout includes a dedicated row for numbers and a directional pad. Needless to say, the ZAGG Pocket is a great option if you’re desperate to use a physical keyboard for the times when you need to knock out long passages of text. The compact nature, in combination with its full QWERTY layout, makes it an effective thing to use on a flat surface after some practice – albeit, it would’ve been great if it were more stable to use on our lap. Dishing out $69.99 will nab you the ZAGG Pocket. That’s on the pricey side, but taking into account its pocketable form factor, it’s definitely warranted. 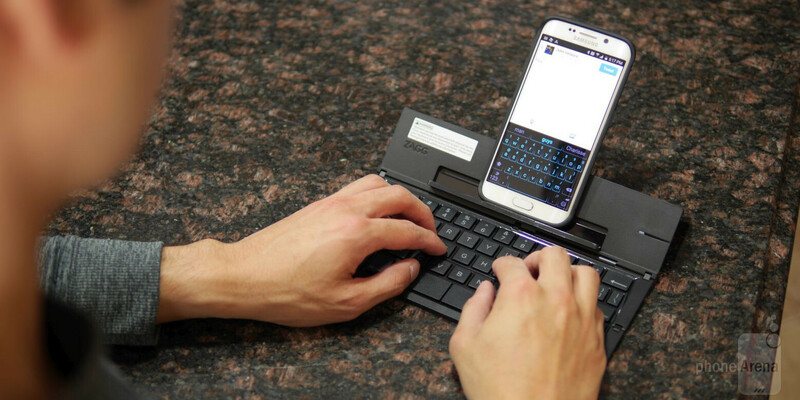 Is this the best portable keyboard out there? That’s a tough one to answer, just because there’s a mixture of good and bad. There are cheaper ones online, but they don’t offer the same folding style of this one – so this is unique in the way it really condenses down for travel. I hate Steve Jobs for killing QWERTY phones. The Samsung Epic was the last GREAT phone. Your anger is so misplaced it's comical. Blame the consumer for not caring about physical keyboards. If people were buying them in droves, they wouldn't have went the way of the dodo. Money talks.